The WD TV media player allows you to directly access content on popular internet websites, such as YouTube, Pandora and Flickr, it can also play back video and audio files streamed from a computer on a home network or stored on external hard drive or USB drives. Although WD TV has enhanced its media compatiblity to various different file formats, however, a lot of people complain that WD TV can't playback H.265/HEVC codec. Before WD TV updates firmware support for H.265/HEVC codec, the best way to stream and play H.265 files on WD TV media player is transcoding H.265 to WD TV media player supported file formats. There are many H.265 HEVC converter application on the market such as DVDFab, FFmpeg, MediaCoder, Cinemartin Cinec, etc. All of them has the capability to decode H.265 files to certain file formats, however, some such as Cinemartin Cinec and FFmpeg are too complicated to operate, others like MediaCoder are equipped with annoying text ads in the software UI, as for DVDFab, there are no benefical video editing functions which have been found on its competitors. After much comparison, we finally settled on Pavtube Video Converter for Windows/Mac (Mac Video Converter Review), the program not only enables you to decode H.265 to H.264 for WD TV playback, but also helps to transcode H.265 to other compatible file formats for LG/Samsung/Philip TV playback or upload H.265 to YouTube/Vimeo. 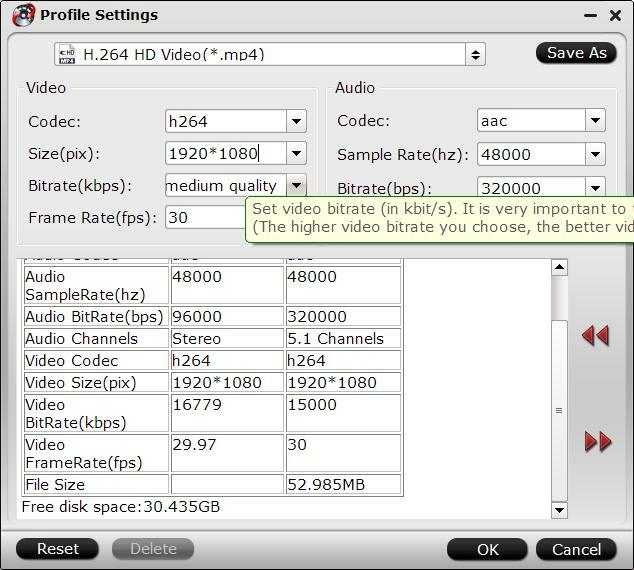 In addition, you can flexibly tweak the output profile parameters such as video codec, bit rate, frame rate, resolution, audio codec, bit rate, sample rate, channels, etc to make them compatible with WD TV media player. 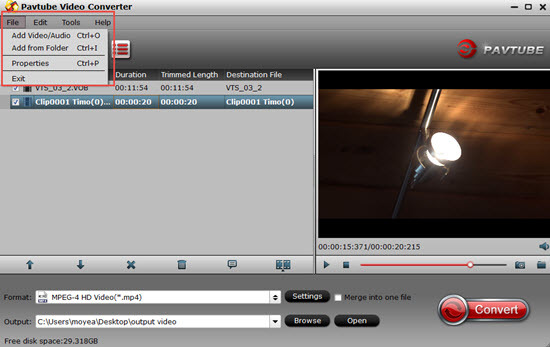 With the program's built-in video editing function, you can trim or cut video to remove unwanted parts, crop video to remove black bars around the video, merge separate video clips into one, split large video into small ones by file size, count, length, add image/video/transparent text watermark to video or apply special rendering effect. 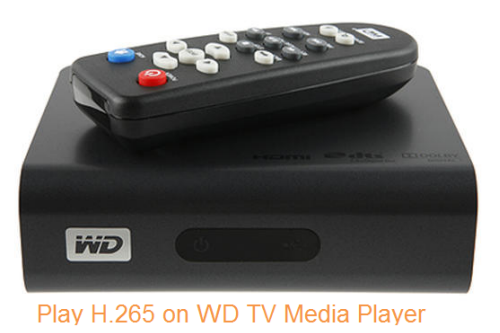 How to Transcode and Play H.265/HEVC Code on WD TV HD/Live/Mini Media Player? Step 1: Imort H.265/HEVC codec to the program. Launch the application on your computer, click "File" > "Load Video/Audio" or "Load from Folder" to import H.265/HEVC files to the program. Step 3:Adjust output profile parameters. Click "Settings" to open "Profile Settings" window, here you can choose or specify the output parameters such as video/audio codecs, file size, bit rates, frame rates, etc as you like. And in the Task information section, you can compare the detailed information of the source video and the target video. 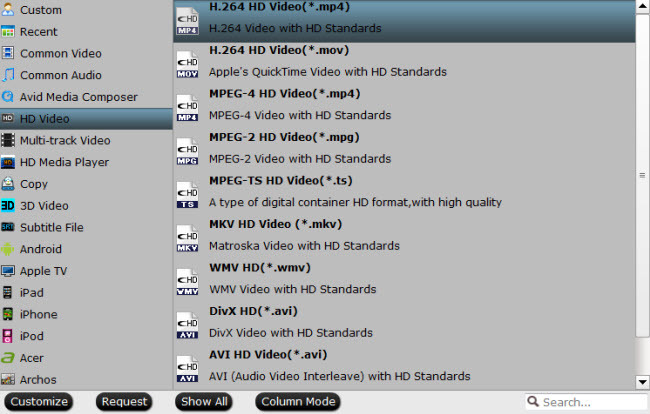 Step 4: Carry out H.265/HEVC to WD TV media player transcoding conversion. Clicking the Convert button in the right-bottom on main interface, a Conversion window will pop out with the detailed conversion information such as Time elapsed, Time left, Generated size, and Estimated size.